To register for the 2019 Musculoskeletal New Ventures Conference, please select whether you will be attending as a "Business" or "Academic/Non-Profit" attendee below. Select "Presenters/Panelists" if you are attending as a speaker. Select "Reception Event Only" if you want to only attend the MNVC reception. All requests for refunds must be submitted in writing and e-mailed to aschuler@memphisbioworks.org. Registration refunds will be issued for all requests received by September 23, 2019 less administrative fee ($150 for Business Attendee and $30 for student registrants). Refunds will not be issued for requests received after September 23, 2019. Registrant substitutions from the same company may be submitted in writing at any time without penalty. 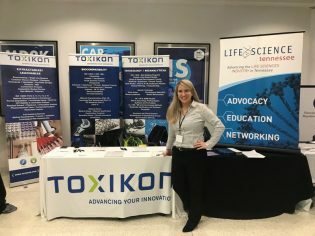 Memphis makes its mark as a worldwide leader in the musculoskeletal industry by hosting the Musculoskeletal New Ventures Conference - MNVC. 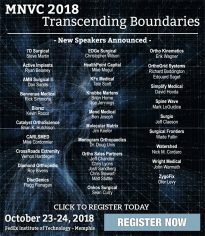 Join us as surgeons, venture capitalists, industry leaders, and researchers gather for this one-of-a-kind opportunity to share information in the fast growing, dynamic and revolutionary field of musculoskeletal research. The 2019 Conference is October 29-30, 2019, at the FedEx Institute of Technology at the University of Memphis. 2019 presenters will be announced soon! 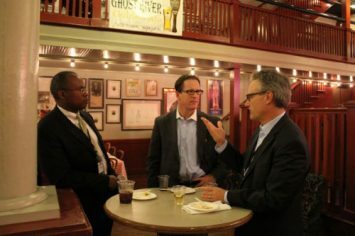 Thank You for Making MNVC 2018 a Huge Success The 2018 Musculoskeletal New Ventures Conference was a huge success! Thanks to all who participated. 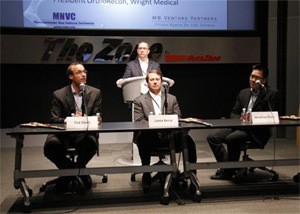 Featured in OrthoWorld: Musculoskeletal New Ventures Conference to Offer Insights on Funding and Startup Climate Orthopaedic professionals can expect to hear a commercialization progress report from nearly two dozen startups at the Musculoskeletal New Ventures Conference (MNVC), slated for October 23-24 in Memphis, Tennessee. 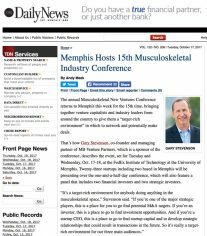 MNVC featured in The Daily News Musculoskeletal New Ventures Conference featured in The Daily News, October 17, 2017.